It is peculiar: Every new Genesis album with Phil Collins as a singer sold better than its predecessor, but exactly the opposite is true for the solo records of the man who is considered the creative head of the band. Tony Banks has never managed to even come near the solo success his band mates have enjoyed. Shortly before Genesis would conquer the world again in 1991 Tony released another solo album, Still. Still could mean: “I still try”, or that he wants to make an impression. It can be understood in many ways. Still was underrated, it had to have become a hit in the early 90s. For Still is a formidable pop rock album that is direct but still rather deep – and it cannot hide the fact that Tony Banks was the driving force behind it. When you listen to the album you will notice four singers besides Tony: Jayney Klimek, who has already sung on Bankstatement, Nik Kershaw, Andy Taylor and none other than Fish with whom Tony recorded Shortcut To Nowhere. You can criticize these multi-vocalist tactics for it does make the album less coherent, but it adds brilliancy. Using a female voice in particular adds a special air. Tony sings one song on the album. Many consider Hero For An Hour the flippant weak point of the album. It seems it was not thought through, perhaps as a kind of filler. So much for the weaknesses of the album. Fish sings two songs on the album. The first one, Angel Face, is the kind of ballad that is not so rare in the prog rock scene. What makes the slow song special are Fish’s voice and the fact that Tony has developed a talent for writing great pop songs. Angel Face was a potential hit in the U.S., but then it was only released as a promo and not put out as a single. Another Murder Of A Day is one of the songs which has Genesis fans in raptures when they play Tony's solo records. It is sung and co-written by Fish. Another Murder Of A Day leaves the pattern of the album in that it does not use catchy melodies. It is also more difficult to get into than, say, Domino or Burning Rope. Nik Kershaw was an icon of the 80s and enjoyed world-wide success with hits like The Riddle and Wouldn’t It Be Good. Later he withdrew from the pop business. The songs he wrote continued to become hits, e.g. The One And Only, which was sung by Chesney Hawkes. Nik sings three songs on Still: Red Day On Blue Street is the opening song and perhaps a tad long for this kind of pop song. Tony has often called it his favourite on the album. Nik actually also co-wrote it. I Wanna Change The Score is another song Nik sang and co-wrote. The song was released as a single and even rose into no-man’s land of the German single charts. On the last song on the album, The Final Curtain, Nik’s voice helps to provide a worthy end for the album. Andy Taylor, ex-guitarist with Duran Duran, also sings on Still. He performs the entertaining pop song The Gift that was released as a single. He also sings what is probably the best song on the album, Still It Takes Me By Surprise. The lyrics are roughly about aging, a new element in Tony’s oeuvre. The ballad becomes very intensive through Tony’s piano and particularly the long solo he plays in the middle. Still It Takes Me By Surprise is a worthy eponym for the album. Jayney Klimek has a similar combination of songs. Her intense voice carries the ballad Water Out Of Vine. She also sings an uptempo pop song called Back To Back, which is not the strongest of the songs on the album. Not just the singers on the album are well-known. Many other famous musicians perform on the album: The usual suspects like Daryl Stuermer (guitar) are accompanied by Vinnie Colaiuta and Graham Broad on drums, Luis Jardim on percussion, Martin Robinson on saxophone and Pino Palladino on bass. The album was produced by Nick Davis. As far as the sound is concerned the album has a new, fresh sound that is only occasionally stuck in the 80s, but nevertheless has not much to do with the 90s either. The album had immense potential. A remarkable set of highly respected musicians recorded it, the songs are catchy, no less than three singles were released, but nothing happened. 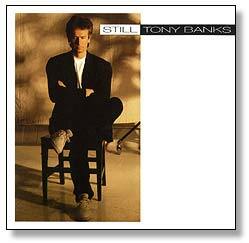 Still is the perfect starting point for newcomers to the world of Tony Banks before they progress to albums like A Curious Feeling. New classic album 2018 from Tony Banks, feat. Nick Ingman. Mechanics-Album from 1991, contains the Hit-Singles Word Of Mouth and Everybody Gets A Second Chance.